The year 2017 is fast coming to an end, and the question on everyone’s lips is, who would be Nigeria’s next president? Although open declarations have been made by the likes of Governor Fayose of Ekiti State, political alignments and manoeuvring are in top gear as epitomized by recent defections by party loyalists and supporters, even though majority of Nigerians can hardly pinpoint who the major gladiators will be in the forthcoming general elections. Nigeria has developed to a stage where the electorate now has a voice and it is becoming clearer that the populace is the major factor to consider in deciding who eventually leads, because the true power lies with them. This was proved in the last general election held in 2015 when in spite of the several allegations and evidences suggesting that the polls were manipulated, the voice of the masses rang through like echoes from the thunderstorm and like a tsunami, it swept the then sitting President Goodluck Jonathan, governors and legislators both at the national and states level. In what appears to be a twist of fate however, many who have followed recent developments in our polity have opined that like never before, the primary responsibility of governance have been overtaken by blame game, victimization and the shear struggle for supremacy between the two major political parties. This development has seen the anti-corruption stance of the government being perceived as politically motivated since those whom reports have indicted for corrupt practices are treated as sacred cows and remained elusive of the wrath of Mr President’s body language. For the first time in Nigeria, monies were discovered in strange places including grave yards, and until now, Nigerians can hardly take stock of how many looters of the peoples’ common wealth have been sent behind bars devoid of political, ethnic and religious inclinations so as to serve as deterrent to subsequent offenders. Many state governors have turned blind eyes to the plight of their workers by reneging on their responsibilities to pay wages and pensions despite having received tranches of the Paris Club Refunds among other unbridled borrowings. Access to basic amenities in some of these states has remained only a figment of the masses imagination. Some have even abandoned the onerous task of leadership to witch-hunt every voice of reasoning that exposes their ineptitude and complacency especially via the social media. With recourse to the 2015 general elections, a major battle had been won. The electorate now reserve the exclusive right to choose who leads them and when. For us, it is our biggest victory as a democratic nation because that single event has set precedence. Again, in 2019, the electorate will march to the polls to exercise that right hence, it is imperative for us to open the encyclopaedia of those we feel have what it takes to lead our country for public perusal. A lot of names have been dropped by lobbyists, political jobbers, politicians and electorates either by direct hint or subliminal messages on who should pilot the affairs of our country come 2019, considering the enormous socio-economic imbroglio the nation is enmeshed in. Frankly, I have been appalled to hear names of people who have little or no integrity, people who in the past have been entangled with one scandal or the other and individuals without the leadership sagacity and political wherewithal to navigate the country in the face of very daunting challenges. In the North, the terrorists are bombing. In the East, there are agitations for secession. In the South, kidnappings and vandalism have remained the order. Across the middle-belt region, herdsmen are on a killing spree while the South-West have become a haven for the popular Badoo gang and ritual killers. Nigeria indeed is at a crossroad. It is now at the centre of development concerns that our leaders have been involved in since independence. Our leaders are striving to find a happy outlet through which Nigerians would stand tall among the comity of nations. Leaders who are capable of facing up to a number of challenges such as fragmentation of the nation, history and knowledge, relaying the foundations of the post-colonial State have to be considered. Across the world, leadership is a serious business and so is Nigeria. I have maintained in previous articles on the need for Nigerians to try something different come 2019 and in this piece, I wish to bare my mind on the man with the Mark of the Biblical David, the Okpokpowulu ki’Idoma. The Senator representing the Benue-South Senatorial District and former president of the Nigerian Senate no doubt is a crux between the old and the new generation and most importantly, the six geopolitical zones. Born in 1948, he attended St. Francis Catholic Practicing School, the Nigeria Military School, and the Nigeria Defence Academy. As an archetypal soldier, he rose to the rank of a Brigadier General. Nigeria is in dire need of leaders with the moral rectitude, strength of character and mental maturity and in my humble opinion; David Mark fits right into this mould. He was Governor of Niger State from January 1984-1986. Mark has also served as Minister of the federal republic. He became a Senator representing Benue-South at the eve of our democratic journey in May 1999. 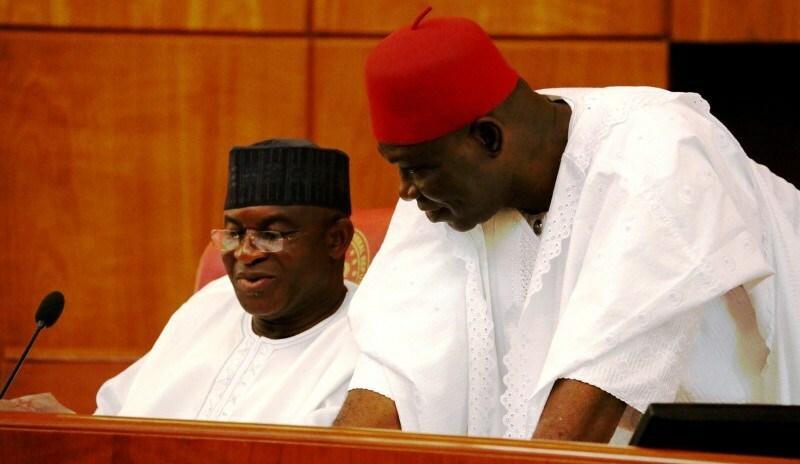 David Mark ran for re-election to the Senate in April 2011 and was elected for a fourth time by his people. Like a Hercules, he presided over the senate as president for a record eight years between June 2007 and June 2015. This is an unprecedented feat, never before achieved by any African. He got re-elected for the fifth term in 2015 as a clear testimony of the trust reposed in him by the people of Benue-South. Renowned for his invocation of the “Doctrine of Necessity” which salvaged the nation of impending political woes during the President Yar’adua era, David Mark cuts the very picture of consistency and stability. He was able to cast himself as an avuncular leader, while presiding over the very demanding legislative duties in the red chambers. The “ideal” Nigerian President should be someone who has proven himself consistently over time. Like the proverbial goldfish, that has no hiding place, Mark’s contributions to the political advancement of Nigeria have dignified him as a trailblazer, mentor and an achiever within the extinct iconoclastic colony of genuine and patriotic African leaders. His contributions and commitment to the educational, sports and economic advancement of our country is also typical. It is high time we began to allow objectivity influence our choice on who should lead us as a nation instead of the usual sentimental and sectional politics that is consistently been promoted in our democracy. Men with histories of competency, unblemished track records and performance, are the people we should consider as presidential hopefuls come 2019 and at an objective level, the politically savvy Senator (Dr) David Alechenu Bournaventure Mark (GCON) is a round peg in the round hole and must be encouraged to exhibit his divine anointing in the overall interest of the country. Comrade Omaga Elachi Daniel writes from Nasarawa State.